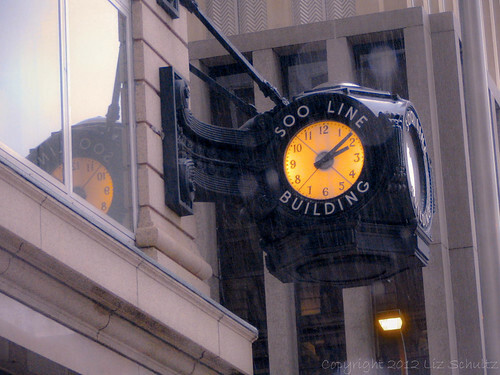 Soo Line -5/365, Archive 365, Downtown, Minneapolis, Minnesota, August 2007, photo © 2007-2012 by skywire7. All rights reserved. Minneapolis has history hidden in the details. Many of the historical buildings are gone but small pieces remain. The camera lens lets you see into a world that might go otherwise unnoticed. This clock caught my eye as we were driving around in the rain taking photos. What a neat find. Plus digging through the old photos makes me want to go exploring for more unique pieces of our past. ARCHIVE 365 is a photo collaboration between skywire7 and QuoinMonkey featuring images from our archives. We will alternate posting once a day in our Flickr sets from July 1st 2012 through June 30th 2013. You can view our photographs at skywire7 Archive 365 set on Flickr and QuoinMonkey Archive 365 set on Flickr. Finale – 3/365, Archive 365, Stone Arch Festival of the Arts, St Anthony Main, Minneapolis, Minnesota, June 2010, photo © 2010-2012 by skywire7. All rights reserved. Here I am, running around the Stone Arch Fest, capturing candid moments of people enjoying a summer day with music and art in the heart of Minneapolis. 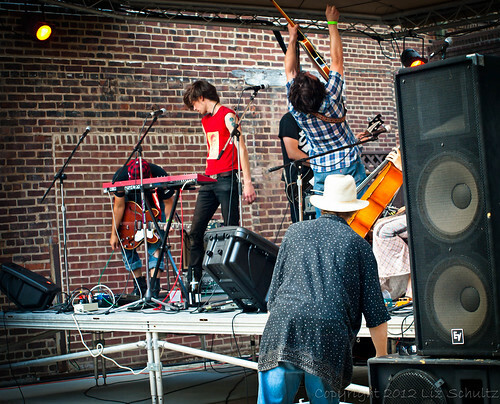 I catch the tail end of this awesome band who were enjoying the climax of their set to the max. But who are they? I still don’t know. I would love to see them again. If someone recognizes the band, let me know! Ears Still To The Lonely Wind — Mandala For Rabbit – 26/52, BlackBerry 52 – WEEK 26, July 10th, 2011, photo © 2011 by QuoinMonkey. All rights reserved. Medium: Drawn by hand with a black Staedtler archival pigment ink Fineliner on Canson Mix Media XL Series 98lb drawing paper, collage paper. Colored & collaged with DecoColor Glossy Oil Base Paint Markers, Caran D’Ache NeoColor II Water Soluble Wax Crayons, Sharpie Medium Point Oil-Based Opaque Paint Markers, Lineco Archival PVA Adhesive, archival card stock paper. Gogyohka & haiga by QuoinMonkey. Photograph taken with a Samsung DROID. It must be a plentiful year for Rabbit. I see her everywhere on my journeys across the Twin Cities. 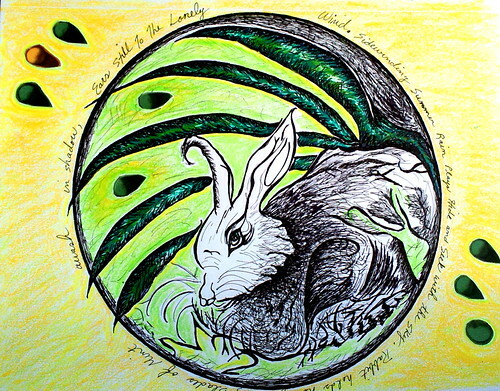 If you look to the spiritual aspects of Rabbit, she represents calling out Fear—looking it right in the eye. It is said that if we focus on people, places, and things we fear, we draw them closer to us. The very act of ruminating on what we are afraid of creates opportunities to learn the lessons conjured by those fears. plays hide and seek with the sky. ears still to the lonely wind. I want to carry my Rabbit fetish from New Mexico in my pocket for the rest of July; there are challenges ahead of me with outcomes out of my control. Is it on the dresser with the other animals? She was a gift from friends, hand carved, and sold at one of the pueblos. I have carried the balsa Rabbit for a long, long time. To help ease my fear. Lucky for me, Fear is a universal emotion. There is not a person on Earth that has not experienced Fear. I read it in the Writing Practices of friends. We talk about it over birthday dinners. I see it at the state, local, and federal government levels. I read about it in the news every day. Naming my fears helps to dissipate anxiety I feel about things I can’t control. Rabbit helps me remember to breathe. And to listen for answers. Ears still to the lonely wind. Art Changes Everything – 27/52, BlackBerry 52 — Week 27 Jump-Off for week beginning July 4th, 2011, Minneapolis, Minnesota, June 2011, photo © 2011 by QuoinMonkey. All rights reserved. Medium: Droid snapshot of the wall outside Intermedia Arts, taken Pride weekend, altered in Photoshop Elements, b&w version. Heat index over 100, sweat soaking through clothes. Last week was one of those weeks when I was searching for inspiration. Lids heavy from the day, the eyes kept roaming, leaped over to the bookshelf, and landed on Ray Bradbury’s Zen In The Art Of Writing. There are books I go back to again and again—for reminders that it’s okay to struggle. For stories about moments of success, paragraphs that sum up in a few words what it means to be an artist or a writer. I don’t separate the two. For me, writing and art are connected. They collectively make up the Arts. I ran my fingers over the worn cover, then opened Ray’s book to the Preface. That’s as far as I had to go. Maybe a few tidbits in these paragraphs will have meaning for you, too. There are hours when I stop dead in my tracks; I don’t want to write anymore. Somehow, the practice keeps going. Not perfect. Tracks. Cairns inside eroded pockets of sandstone cliffs. So I collected comics, fell in love with carnivals and World’s Fairs and began to write. And what, you ask, does writing teach us? First and foremost, it reminds us that we are alive and that it is a gift and a privilege, not a right. We must earn life once it has been awarded us. Life asks for rewards back because it has favored us with animation. So while art cannot, as we wish it could, save us from wars, privation, envy, greed, old age, or death, it can revitalize us amidst it all. Secondly, writing is survival. Any art, any good work, of course, is that. Not to write, for many of us, is to die. We must take arms each and every day, perhaps knowing that the battle cannot be entirely won, but fight we must, if only a gentle bout. The smallest effort to win means, at the end of each day, a sort of victory. Remember that pianist who said that if he did not practice every day he would know, if he did not practice for two days, the critics would know, after three days, his audiences would know. A variation of this is true for writers. Not that your style, whatever it is, would melt out of shape in those few days. But what would happen is that the world would catch up with and try to sicken you. If you did not write every day, the poisons would accumulate and you would begin to die, or act crazy, or both. For writing allows just the proper recipes of truth, life, reality as you are able to eat, drink, and digest without hyperventilating and flopping like a dead fish in your bed. I have learned, on my journeys, that if I let a day go by without writing, I grow uneasy. Two days and I am in tremor. Three and I suspect lunacy. Four and I might as well be a hog, suffering the flux in a wallow. An hour’s writing is tonic. I’m on my feet, running in circles, and yelling for a clean pair of spats. -Ray Bradbury from the Preface of Zen In The Art Of Writing: Essays On Creativity, © 1990 Ray Bradbury, original from “The Joy of Writing,” Zen & the Art of Writing, Capra Chapbook Thirteen, Capra Press, 1973. And that is why I went to my studio and ate up the time with myself. So the world would not devour me. 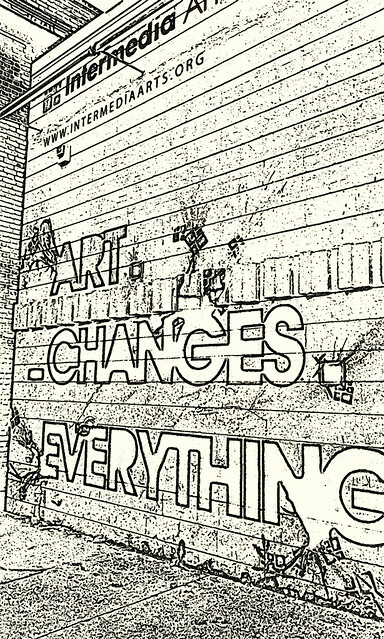 Time to sit and listen to music, to stare out the window, to write a few lines of poetry, to sketch at the ragged edges of the page, to find inspiration on a wall outside Intermedia Arts. Time to take up arms and fight, the smallest battle, the smallest effort to win. Art Changes Everything – 27/52, BlackBerry 52 — Week 27 Jump-Off for week beginning July 4th, 2011, Minneapolis, Minnesota, June 2011, photo © 2011 by QuoinMonkey. All rights reserved. Medium: Droid snapshot of the wall outside Intermedia Arts, taken Pride weekend, altered in Photoshop Elements, color version. 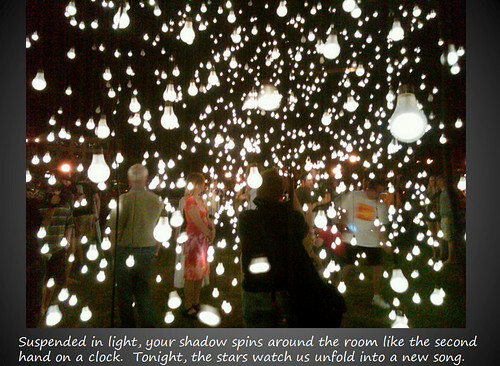 Suspended In Light (Haiga), 23/52, BlackBerry 52 – WEEK 23, June 2011, haiga © 2011 by A~Lotus, photo © 2011 by QuoinMonkey. All rights reserved. Medium: Original BlackBerry photo Scattered Light taken by QuoinMonkey in June 2011 as part of Northern Spark — Twin Cities Nuit Blanche. Poetry for the haiga created and edited by Lotus using Adobe Photoshop CS2 & MS PowerPoint 2007.
we take refuge in the Wind. Storyboard response to the haiga collaboration with Lotus. We will continue to bounce off of each other’s BlackBerry Jump-Off photos with text, photography, poetry (however we are inspired) for the 52 weeks of 2011. You can read more at BlackBerry 52 Collaboration. 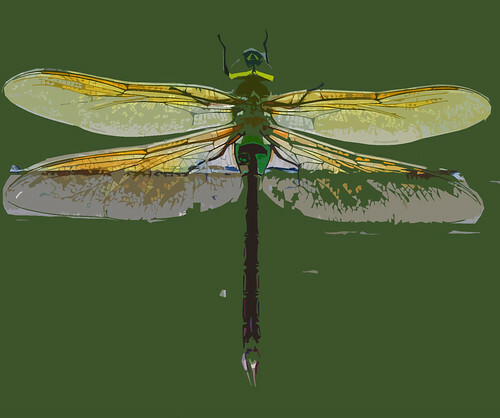 If you are inspired to join us, send us a link to your images, poetry, or prose and we’ll add them to our posts. weekend, June 2011 in response to Lotus Jump-Off – The Biggest Heart. knows how to hold its differences. 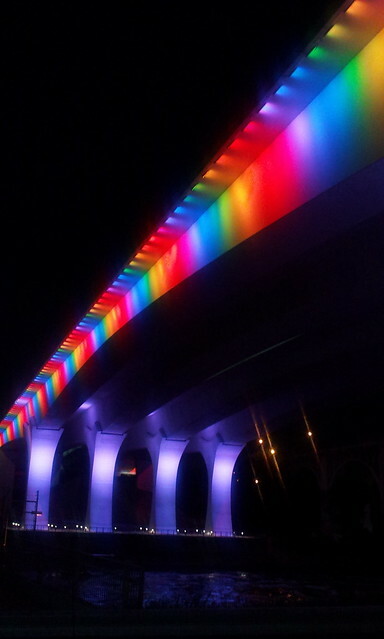 Photos: Bridge Light, I-35 Bridge In Rainbow Colors For Pride – 24/52, BlackBerry 52 — Week 24, Minneapolis, Minnesota, June 24th 2011, photo © 2011 by QuoinMonkey. All rights reserved. Medium: Droid snapshots of the new I-35 Bridge on Pride weekend, June 2011 in response to Lotus Jump-Off – The Biggest Heart.